Fences are supported by a series of posts buried in the ground, which provide stability as well as hold up the barrier slats or links. Whether made from wood, chain, plastic or wire, fences all need posts spaced at given intervals. The amount of space recommended between each post will vary by fence type. Fence posts should be placed every few feet. Fence posts support the material that makes up the bulk of the fence. These posts have to be able to stand up to animals, trespassers and unfavorable weather conditions. If the fence posts are spaced too far apart, there won't be enough support to keep the fence straight in high winds, causing the fence to sag or fall over. There are two main types of fence posts: terminal and line. Terminal posts are either corner posts, end posts or gate posts. They mark the beginning or end of a stretch of fence. Terminal posts are larger and stronger than line posts, since they have to handle more of the forces that act against the fence. Line posts are required to hold up the fence and need to be placed at specific intervals, depending on the type of fence. 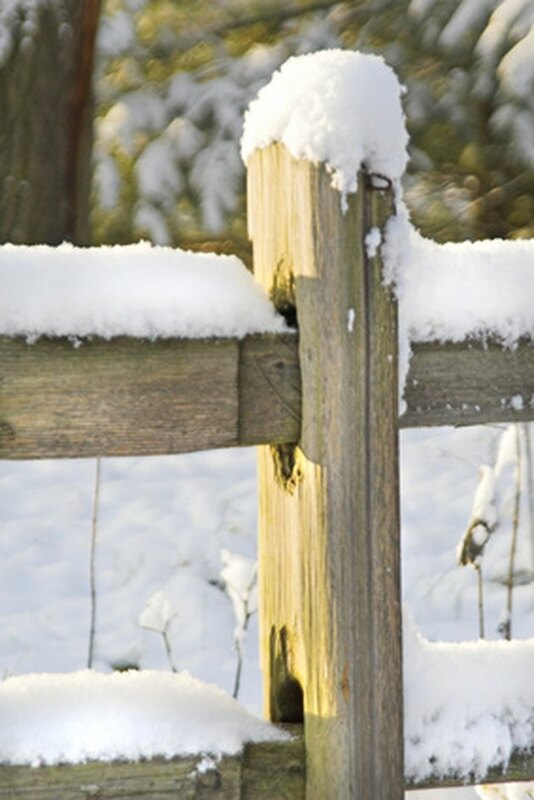 Most wood fences are spaced 8 feet between fence posts. This isn't for a structural purpose, although 8 feet provides enough support for a wooden fence. Dimensional lumber is usually available in 8 or 16 feet lengths, so having posts 8 feet apart means less cutting and wood waste. Chain link fences do not catch the wind as much as some other types of fences. Because of this (and despite the flimsy nature of chain link), line posts may be spaced up to but no further than 10 feet apart. Wire fences are often used over long distances, such as for large ranches or property boundaries, so they occasionally need stronger supports than just numerous line posts. Brace assemblies are installed on all wire fence terminal posts to help keep the fence stable. On runs where the fence stretches more than 650 feet in a single direction, there should be a line post with a brace assembly every 650 feet. In between the brace assemblies, line posts should be spaced 15 feet apart. Plastic panel (or any other type of panel fence) is the easiest to space, since the size of the panels will determine the distance between the posts. Measure the panels and add the width of the posts plus 1/2 inch to figure out how far apart to place the posts. Remember that you are measuring from the center of the post, not the edge. How Far Off the Ground Should a Picket Fence Be?